Less than 24 hours ago if Alex Trebek asked me what a Blaupunkt was I would have stared blankly at the camera. It all started with a traffic jam due to the Folsom Street festival in San Francisco. To avoid the messy backup in SOMA we aborted our trip to our favorite non mid-century furniture store, McCarney's, and headed to The Other Shop on Divisadero. 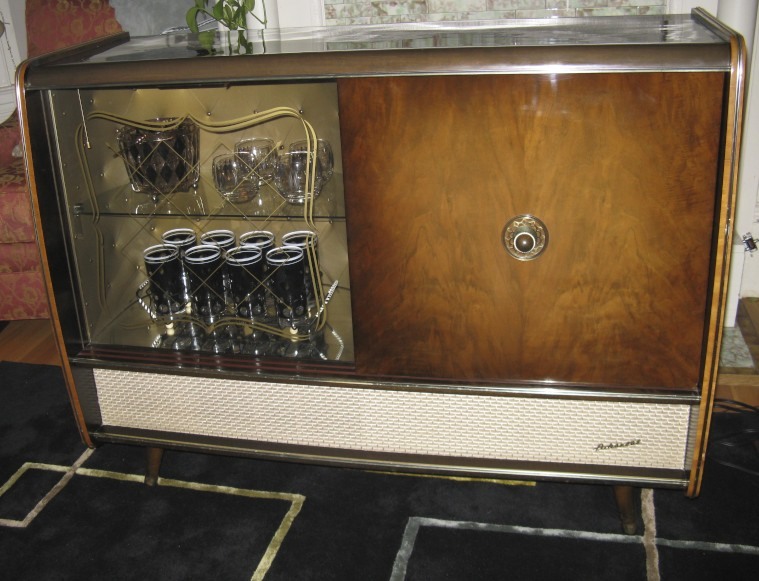 The moment we walked in, we independently gravitated towards this gem from the past - a Blaupunkt Arkansas model 4635. 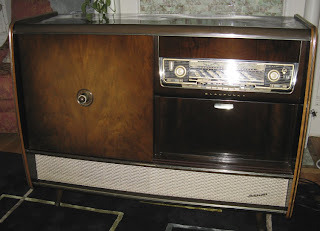 I have seen other radio consoles before but this one seemed to be the cream of the crop. Immediately we confessed that this was the perfect antique that represented a blend of our styles. For David it had a vintage AM/FM radio while for me another location to store my ever expanding barware collection. At one time there was a small turntable inside that appears to have been kidnapped within the last 50+ years. But otherwise, the piece is in mint condition. If it fit in our SUV then it was going to be ours. You guessed correct. It fit. Since my German skills are non-existent, my online research is limited to a handful of chat rooms, images and old eBay ads. What I have been able to gather is that our model was made in 1959 in Germany by the Blaupunkt company better known for their car radios. How it landed in a vintage store in the Lower Haight is a mystery but it is a great reminder how hip stereo equipment had been in the late 50s/early 60s. And with most things German, it was built to last. The really fun part is that all the radio keys are in German so it took David a few attempts to figure out not only how to work it but to test whether he could hook up his iPod to it (a success). But the radio comes in loud and clear. For those interested in practicing their German. Crazy question, I am selling one of these, I am curious to know what you paid for this, if you don't mind. Thanks. I have one of these also that been in the family, over 60 some what yrs interested in selling it to best offer.